Dave has been surrounded by running since an early age. Born and bred in the hills of Central NY, and home to some of the best young distance runners in the country, running is part of his culture. His mantra. Surrounded by great mentors and coaches in his early years, Dave had the opportunity to learn from some of the best the New York and New England regions had to offer in coaching. Consistently learning from his coaches, reading and studying the concepts of endurance, and finding a true understanding of the physiological aspects of the sport, has shaped Dave into a successful coach in 17 years. A competitive runner for many years, Dave still enjoys training and racing, but the love for coaching has now become his full time commitment. Helping runners achieve their goals has more sense of satisfaction than any race today can give Dave, who's now in his mid 30's. Dave resides in Los Angeles, CA and also spends a good amount of time in Boston, MA. He is married to his beautiful wife Gregoria, who is an Ultra Runner, kickboxing instructor and righteous Mexican cook! Based on training principles of the great Arthur Lydiard, I take time with my athletes. Good marathons, or goal races of any distance are not run on 8 weeks of training. It's about building a foundation, developing that foundation, sharpening that foundation, and finally....letting it roar! I take a mostly aerobic approach to running, with anaerobic principles being applied to races that are of a shorter distance. Ame For It Run Coaching athletes come to the line prepared. Each week of training consists of something different. Failure to change up the training routine can make the runner stale. Failure to race consistently can make the mind weak as well, which is why I encourage my runners to jump in a race once per month. The above mentioned may sound like it is for the Elite, however, this approach is used for all of my athletes, no matter the ability level. While the training plan is always individualized for the runner, everyone starts in the Base phase, first. You cannot build a house by putting the roof on first. While injuries can always be a part of running, I like to get you strong, before I get you fast. Via this method, I have had a great success rate keeping my athletes injury free, as many runners who are now training under me, and were prone to injuries in the past, are running happy and healthy! That's the goal, right!? Running is also a psychological sport. When it's cold out, it's raining or snowing, the workout is tough, Ame For It athletes, begin to shine. I like to work on the mental game with the runner. It is part of the coaching package. A fit runner is never going to be a great runner if he or she cannot block the mental obstacles running can sometimes bring. We work on the mental aspect weekly. 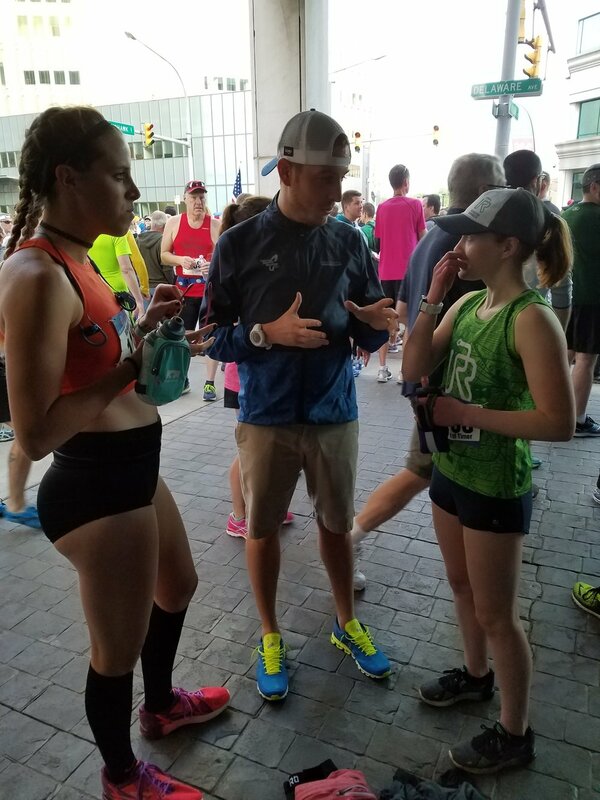 I always educate the runner on why we are doing what, and how it will help them come race day. This is important as it translates well to the starting line. When the going gets tough in a race and the pain begins to build, Ame For It athletes can always say, I've been here before. Run Hard. Dream Big. Be Prepared. It's the Ame For It Run Coaching, motto. You do the running and i'll take care of the rest. Over 17 years coaching experience, working with runners of all ability levels from High School Track and Cross Country to Elite Master's long distance running. A good coach is always learning. Failure to keep up with this sport will bury you as a coach, early in your career. Whether I believe in it or not, I will study it. Contributing Writer for Road Trail Run and Believe in the Run for gear reviews on running shoes, apparel and accessories, including run nutrition (gels, electrolyte drinks, etc) Consistently trying and testing new products! I will help you find and train in the right gear! Since 2004, 91% success rate of an athlete achieving a PR in a training cycle. Within the first 3 months of training, 95% of current athlete roster have PR'd in tuneup races! Historically low injury rates among athletes over the years. Train smart, not dumb! Interested in joining a Competitive Racing Team? Want to compete in Club Cross Country Championships, Road Races and Track and Field Meets? Dave is currently looking to field teams for Cross Country, as well as add athletes to the current Elite runner, roster! A Rhode Island native, Andrew capped off a successful collegiate career at the University of New Hampshire. His post collegiate running took him to Dave's old neck of the woods, where he is currently a teacher and Cross Country Coach at Liverpool High School, a national powerhouse in Cross and Track. Andrew's focus with Dave has been the Marathon and he will focus on a strong sub 2:22 attempt at the 2019 Boston Marathon. In 2018, he was in the Top 30 US Men in the nasty weather. He recently PR’d at the Houston Half Marathon in January 2019 in 1:08:18. Andrew is a key member of the Syracuse Track Club and also races USATF Cross for them each fall. Originally from Wyoming and a Black Hills State University graduate (SD) where she ran Cross and Track, Robyn excelled in middle distance events. Since coming to Upstate NY, Robyn began working with Dave on building her aerobic capacity over speed, and recently qualified for Boston 2018. Robyn will "Ame" for a sub 3:05 Marathon on the line in Hopkinton, MA in the Spring.